There are many reasons why people want to change their car wheels. The two main reasons are the appearance and the performance. There is no reason to change wheels on some cars that come with really nice and cool wheels, but some cars have ugly wheels that need to be changed. Besides the new look, new wheels give you better performance, with smooth ride. 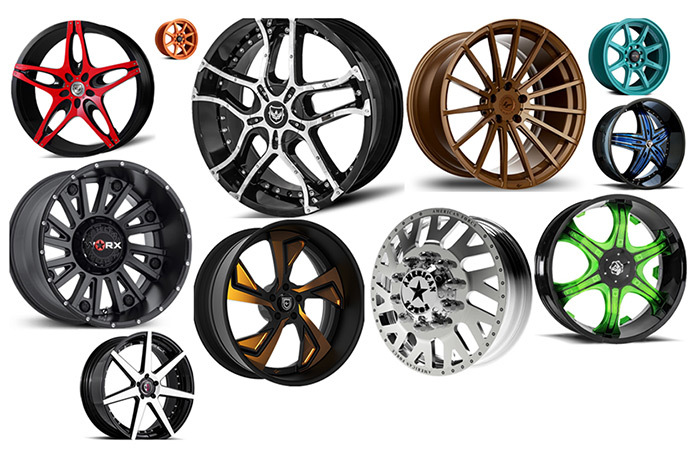 There are many kinds of car wheels and rims available on the market. The basic ones you should pay more attention is the price, sizes material of wheels and tires and of course the specifications of your vehicle. One of the most popular types of wheels on the market are Aluminum wheels. These wheels are lightweight, inexpensive to produce, and come in a variety of shapes and sizes. The other popular types of wheels are alloy wheels. Alloy wheels are wheels that are made from an alloy of aluminum or magnesium. Alloys are mixtures of metal and other elements. Although you can ask experts what metals are used in alloy wheels based on the manufacturer? These are lightweight wheels that provide greater strength and have higher heat conduction capacity. Less weight means quicker acceleration and stopping, less strain on suspension components. Sportier vehicles usually use alloy magnesium wheels called “Mag wheels”. The advantage of these wheels is that they have high corrosion resistance. Magnesium wheels are also inflammable, so they are not recommended for motorsports in the U.S.
One of the most durable wheels are Chrome wheels. Take any wheel and add layers of chrome to it and you’ll get chrome wheels. The advantage of these wheels is not only being appealing, they are quite durable in different weather conditions Chrome wheels are a perfect choice for drivers who live in wet regions. This is why chrome wheels are more expensive, than other materials. Steel wheels are known for durability and being easy to fix. These wheels are commonly used on commercial trucks and consist of two pieces, the center and the outer barrel. The wheel must be durable, enough for the type of driving you do. Lightweight wheels are more sensitive to dents and cracks. As we have already mentioned, the plus concept is one of two basic reasons drivers switch wheels for. The wheel must fit vehicle, otherwise it can lessen performance and stability, causing a higher risk of collusion. Small wheels give a low profile look to your car. Plus sizing of your wheels and tires is the best way to improve the performance and gives muscular and sportier look to your vehicle. The best off roading accessory for your Jeeps and Trucks are the wheels. With changing the wheels you can get bigger tires for better performance and stronger rims that will last a long time. The bonus part of it will give a better look and style to finish it off. We also have replica wheels available. Most people cannot tell the difference between factory and replica wheels. From the outward appearance it usually looks the same. Some replica wheels are forged with precision details, while other factory wheels are produced with simple casting. So the quality of a wheel doesn’t depend on who made it, but how it was made. We sell a wide selection of aftermarket and replica wheels. To avoid getting the wrong fitment of wheels and tires, you can get an entire wheel and tire package as a set. That will include the rims wheels, tires, precision balancing and installation. It will save allot of time and hassle. Even though our professionals will help you to choose the right wheels for you and make sure that every wheel fits safely and properly on your car.